I reached halfway of the course at AS5 with 30 minutes to spare before the cut-off time of 14 hours. After eating and resting, I continued the run but after hiking for about 2 kilometers, I declared myself as DNF due to knee pains and fatigue. The race was over for me and I needed some rests and tried to assess my running capabilities as I was about to reach the age of 61. After one month of rest/recovery and some lackluster training, I tried to join a 100-mile trail run just to test myself how far I would go. I registered to the said race five months before the race and made the TNF 100 as part of my training/preparation. I failed again in this race due to heat exhaustion/fatigue; dehydration; and poor nutrition plan. I reached the halfway point of the race barely within the intermediate cut-off time. I was allowed to pass the Checkpoint and continue with the race but instead, I simply hiked up to the next checkpoint and I was the last runner on the course until I was finally declared DNFd at the next Checkpoint. After one week of rest/no running, I entertained the idea of getting the services of a Ultra Running Coach. And I got one. After some exchanges of notes and messages, I was ready to start my training for the next year’s TNF 100 as he gave me a training program to start with. It was in the middle of June 2013 when I started a structured training plan which was 100% done on the trails. The training was based from my age, number of years of running, and previous running-related injury/injuries. Monday is my Rest Day and the rest of the days of the week were on trail running with at least, 500 meters of elevation gain/loss in every 10K distance (6 miles). I started to have a mileage of 80+kilometers for a week. And as I got stronger on the trails, I would reach up to 110-120 kilometers per week on my peak training program where I would reach to higher elevations and mountain peaks. I was made also to do some strengthening exercises for the leg muscles and core muscles which I do once or twice a week. Speed work on the trails was also done at least, once a week. In my long runs, I had to test the best nutrition that my body would respond. I tested for purely water in my training. I tested also for powdered mix preparation which could be diluted with water. I would also test for solid foods ingested during training. But what was critical was to test the use of Power Gels/GU Gels and how they give you the much-needed energy during training. I would also test my trails shoes comparing them as to their weight once they are damped with my sweat or being wet from submerging myself in creeks and streams. I would also test my shirts and shorts as to which one are prone to chafing on any part of my body. For the training and preparation for this year’s TNF 100K Trail Run, my post, “The Hay Is In The Barn” explains everything to it, to include proper tapering before the race. Aside from reducing the number of mileage within two weeks before the race, I also put more time to sleep and rest on the last week before the event. I was averaging 9-10 hours of sleep, at least, 3 days before Race Day. On the early morning of Saturday after I had my shower (2 hours before gun start), I ate a full meal of rice, noodles with pork (pandit canton), vegetables, chicken, and hard-boiled egg; had my hot coffee; and took some amount of water. After the meal, I made sure I rubbed a lot of Body Glide to my body parts which I expected to have some chafing. I took my time fixing my attire/running kit from head to foot. I made sure that my shoe laces are tight but making the ride as comfortable as it can be. 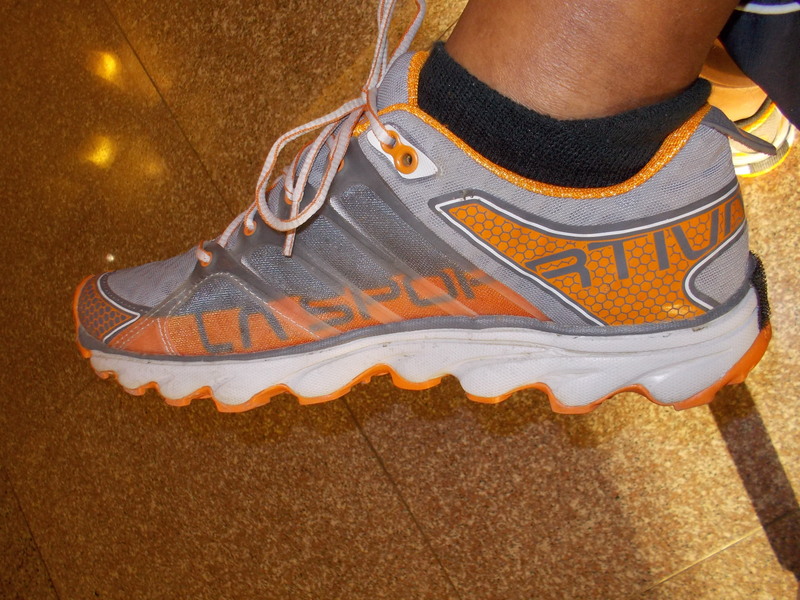 I decided to wear my La Sportiva Helios which had been my DNF shoes in my last year’s races because it is the lightest and the most responsive shoes on technical trails. My Patagonia Shorts are battle-tested in the CM42 & CM50 trail races. My white long-sleeved PAU Shirt by A Simple White Shirt had been with me in my long runs in my playground. Aside from the Buff Bandana on my neck, I have also a sweat bandana by Mountain Hardwear wrapped on my forehead which was covered by my TNF Running Cap. After having tried the Compressport Calf Sleeves in my training, I opted to use the Ultra Model for the race and I never had any cramps or signs of having some pains in my calves. They were also useful as “sweat traps” to prevent my socks and shoes from being wet and protection for leech bites on the forested sections of the route. One and a half hours before the race start, I was already at the Starting Line for the Mandatory Gear Check. I was carrying a tightly packed UNIQLO Light Windbreaker Jacket inside the backpack of my Ultimate Direction’s Anton Krupicka Signature Series Hydration Vest with two bottles of Simple Hydration and seven packs of GU Gels stacked on the different small pockets of the hydration vest. I had also a thin plastic poncho which is packed tightly inside my backpack. I was carrying a Fenix handheld flashlight on my hand and a Black Diamond headlamp on my head. I got the whistle from my Salomon XT S-LAB Hydration Pack and have it tied to my UD Hydration Vest. After the race check-in, I returned to my vehicle and mentally reviewed my race and nutrition strategy. The Race Strategy was to arrive at the Intermediate Checkpoints with at least 2 hours as “buffer” time before the prescribed cut-off time and to pass as many runners along the way since I will be starting from the back of the pack. The nutrition strategy was to ingest one GEL every hour, alternating one flavor to another out of the five (5) flavors that I included in my pack. Eat solid foods and carry some food on Aid Stations where my support crew would be waiting. As I did in my training, two bottles of water would be enough for my hydration needs for at least 20 kilometers with an option to drink some more if there are sources of water along the route where I could refill. 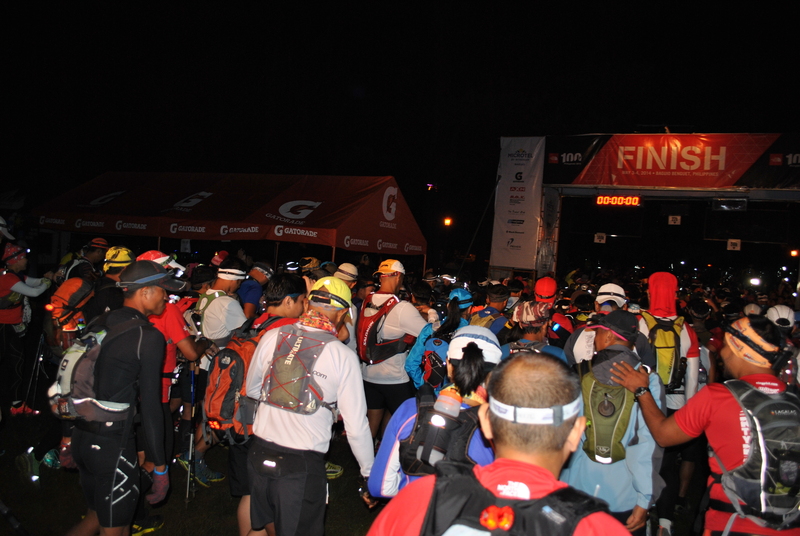 Thirty minutes before gun start, I had to pee and took my first GU Gel. Composed and relaxed, I joined the rest of the runners and positioned myself at the back of the pack with the rest of the “usual suspects” in ultra marathon in the country. At exactly 3:00 AM, the race started and I slowly moved forward to cross the START/FINISH arc by walking. Once I reached the paved road of Camp John Hay, I started to jog. My jog slowly became a run until I started passing some runners who would start hiking on some ascending parts of the first kilometer of the route. My run became faster on the descending roads and maintained my pace on those uphill ones. I remember last year that I was hiking on the first 2-3 kilometers of the route with a pair of trekking poles. But for this year, I was not using any trekking poles. In all my training runs for this year’s TNF, I never used my trekking poles. I tried to use them in H1 last February without any training and it gave me some problems with my pace. I just followed one of the “basics” in ultra, never use anything that you did not use during your training. While running on the paved roads in front of Baguio Country Club and parts of South Drive, I have already passed a lot of runners and after hitting the trails of Camp John Hay, the group of runners in front and behind me had thinned out already. I had already my own space on the trail and I would have the freedom to dictate what pace I would be doing. The headlights in front of me would be my guide to determine how fast I would be running. I just took it easy to run the uphills and the downhills until we reached a populated area but we were still within the vicinity of Camp John Hay. Last year, I was overtaken by the lead runners of the 50K race which started one hour after our start time but for now, there was no way that the lead runners of the 50K would overtake me along the trails of the Camp. After one hour, I was already on the downhill approach towards the mining community of Itogon. I was surprised to find out from my Garmin that my Average Speed was 7-8 kilometers per hour. At daybreak, after 2 1/2 hours after start time, I was already approaching AS #2 and I have run a distance of 20 kilometers at this point. I did not stop at AS #2 and kept on running on the easy flat and ascending parts towards the mining companies in the area. After passing a Gate/Guard Outpost of a Mining Company, the route started to ascend and I tried to run slowly until I passed more runners who were hiking. As we left the Mining Company perimeter, it was the start of the first never-ending steep ascent towards Barangay Ampucao. More runners would step aside from the trail as I passed them. I had a refill of water for my bottles when one of the marshals told us that the flowing water coming out of the water pipe is potable and clean. 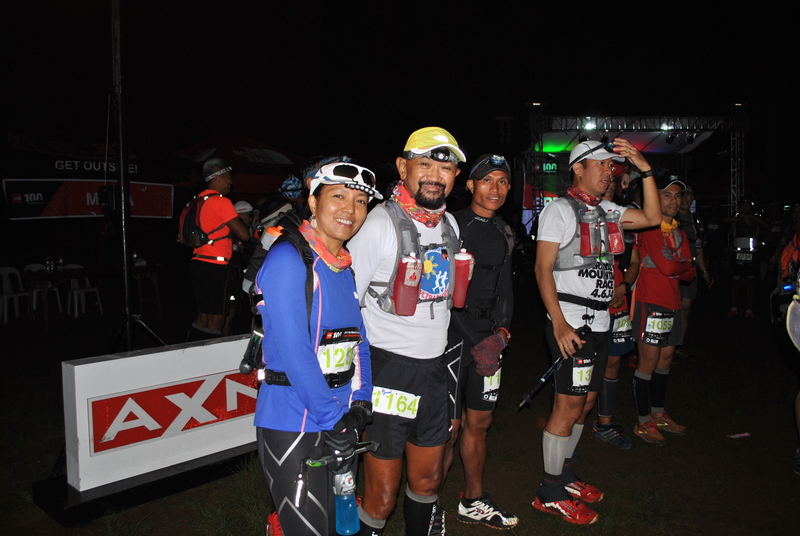 After some uphill and downhill, I was already near the Ampucao Aid Station. 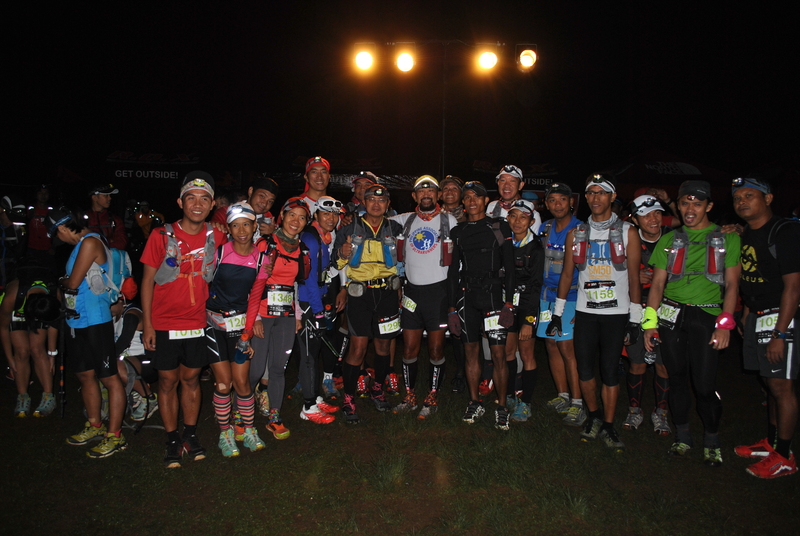 I reached AS #3 (Ampucao) at 7:30 AM, 4:30 hours after Start and I was happy and surprised. I had 3 1/2 hours as “buffer” before the cut-off time and I was 2 hours faster than my last year’s arrival time in this place! I immediately made a refill of water to my hydration bottles at the Aid Station and tried to glance what were the foods available. I saw some boiled bananas and boiled camotes and I did not attempt to pick up any of them. Instead, I approached my support crew and gave me hot noodle soup which I requested with two slices of fried Spam. I took my time to eat some solid foods after ingesting at least 3 GU Gels of different flavors for the past four hours in the race. After almost 30 minutes, I was done with my rest, eating, and hydrating myself with colder water. I was back on the road at 8:00 AM with a target time to reach Barangay Alang at 11:00 AM. Last year, I left Ampucao at 10:00 AM. Ampucao to the “Mossy Forest” is mostly an uphill part of the course. The trail was too narrow and there are portions where there are too many rocks on the trail. I went up fast enough as I was confident with my training. I would slowly jogged on the flat portions and downhill sections of the course. Some trails are also enough for the cow’s feet to move within the place as this place is used as a ranch for cattles. This is also the part of the course with a breath-taking views of the Philex Mines, Baguio City, parts of Eastern Pangasinan and the San Manuel Hydro-Electric Dam, and the Mount Santo Tomas-Cabuyao mountain ranges, which is the other half of the race course! I did not have much time to stop and look around the views all around the place as I was focused to the very narrow and technical trail in front of me. I’ve been in this place for two times in my recon runs last year and it was enough to glance on spots where I would laugh and remember what my running friends had experienced in this place. Before entering the “Mossy Forest”, I knew I had enough “buffer” time. It is a proof that my training is paying off and I was excited that my body was still strong. I had to overtake some more runners and sometimes allow the faster runners to pass me. And looking at the faces of those who would overtake, I am just happy that they look like they are half of my age! At this point, I was 2 hours ahead as compared with my time last year. I purposely power hiked once I entered the “Mossy Forest” in order to take time for my body to rest after the uphill climb. I started to eat a sliced Korean Pear which I took from my support crew at the Ampucao Aid Station. The sliced Korean Pear was placed in a plastic bag and soaked in some ice. Eating such cold, juicy and sweet Korean pear was heaven in my mouth! Eating this fruit after ingesting one GU Gel is something that I would recommend as a good nutrition to ultra runners! I would jogged on the wider parts of the trail in the mossy forest which are mostly downhill. There are steep portions where one has to be extra careful on ones footing on the ground. There are also two portions where a runner has to rappel with a rope to go down from a higher to a lower ground. I could remember also that once there will be some uphill climb after the rappelling sections and pass by a “house with a water hose”, it is a sign that in a few minutes, I will be reaching AS #4 in Barangay Alang. A lady race marshal was waiting at the “hut with a water hose” and she told me that the Aid Station with food and drinks is very near. I asked the Lady Marshal of my ranking and she told me that I was #91. It gave me a boost to slowly jog and try my best to reach the Aid Station within the targeted time—11:00 AM. After a few minutes, I was out of the forest and I could see the Aid Station with runners eating, drinking and refilling their hydration systems. The Medical Personnel asked me if I need some massage on my legs and I said, No, it would be enough that I would just sit and have a taste of the food prepared at the race. I was disappointed to eat a rotten ripe banana (lakatan). I think I had to get another one and peeled it with the same result. Instead, I took two small packs of Chocolate Drinks (Chuckie) and consumed the drinks! 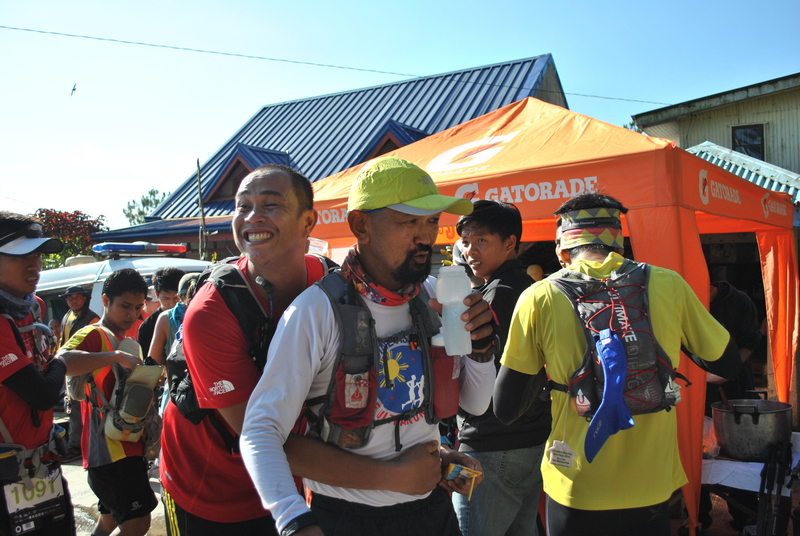 I made sure also to drink a lot of water in the Aid Station and made a refill to my bottles in order to anticipate the hot temperature as I go down to Kennon Road (AS #5). I still have some solid food in my pack which I would eat as soon as I would leave the place. 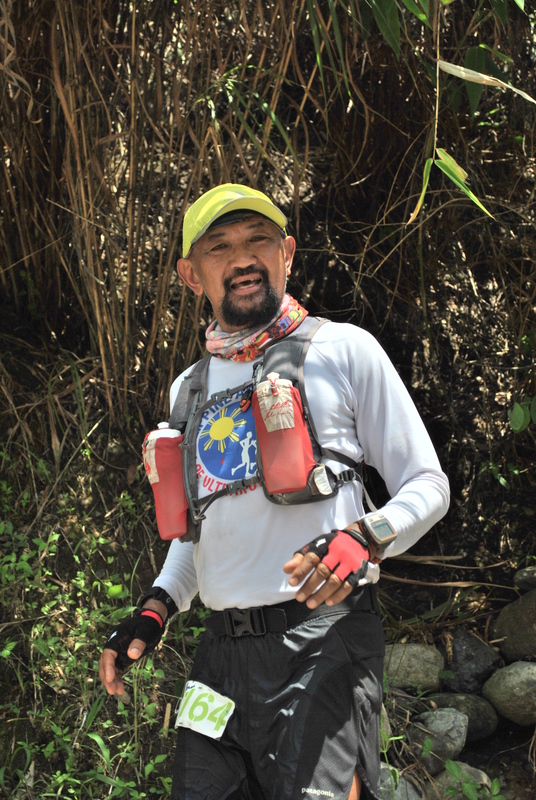 In about 15 minutes, I was already back on the race and I was ready to face my “waterloo” in my last year’s race—the 12K downhill run from Barangay Alang to Bridal Veil, Camp #1, Kennon Road which is popularly known by the locals as “Ligay” (Wheel). After jogging for about one kilometer, I brought out the food which was handed to me at the Ampucao Aid Station by my Support Crew—boiled sweet corn! I had to eat the corn from the cob as I walked on the slight uphill climbs of the course. It was too convenient for me to bite a part of the corn from the cob and then chew the corn in my mouth while running downhill. I practiced this kind of eating some corn from the cob while running during my training. It takes some time to chew the corn but with a small amount of water sipped into the mouth, the corn could be easily ingested. After a few minutes, I was able to eat one piece of corn on a cob and jogging downhill was just so easy for me. At the middle of the 12K route, there is a convenience store where I would see some runners starting to leave the place once they see me approaching the place. I guess, they are making me as their “reference point” that they need to hurry up or else they will get passed by a Senior Citizen. I decided to buy two bottles of Coke (they were not cold) for my personal consumption in this convenience store. After a few seconds, I noticed a younger, tall and dark runner who ordered one bottle of coke and I said to the lady owner of the store that she would deduct the payment from the change of my money. The young runner was surprised to know that I paid for his drinks and he thanked me. I asked him if he is a local runner (Ilocano) or a runner from the South in Tagalog dialect. He told me that he came from Indonesia to join this event. We started a conversation until we left the store and started running. He was behind me for a few minutes and only to find out later that he completely disappeared from my sight. I guess, I was really faster this time in downhill running as compared in my last year’s experience. I would meet some locals in the area and race marshals preparing for their food/lunch and telling me that the next Aid Station is very near. I would say “Thank You” to them but I usually look at the horizon and the nearby mountains and compare where I am for me to gauge and estimate my elevation. As I can see that I am lower than the ridges of the nearby mountains, I can conclude that I am really getting nearer to the next Aid Station which is the Bridal Veil Falls at Camp #1 in Kennon Road. Some of the younger runners would overtake me but I maintained what I’ve trained for in downhill running which is appropriate and adjusted to my age and personal capabilities. I knew I was doing good in the race as compared to my past experience last year. I just needed some patience, focused concentration, and positive attitude for me to reach the halfway point without any problems, “issues” or injuries. I had to hydrate some more as the sun’s heat was already at its highest. As I glanced to my watch, I was surprised to see that it was 1:20 PM and I was almost one kilometer away to the Aid Station! I reached the Aid Station at 1:30 PM with 3 1/2 hours as “buffer” before the cut-off time. It is insane to think that I improved 3 hours faster time than in last year’s race! You’re inspiring , an inspiration for me to join trail races. I have no experience but I want to learn the basics . I’m 64 yrs old. Had climb Mt. San Bernardino, Mt. Pulag and hike for at least 1 hr whenever I’m off work . I observed that after hiking for sometimes that I could jog up and down the trails .